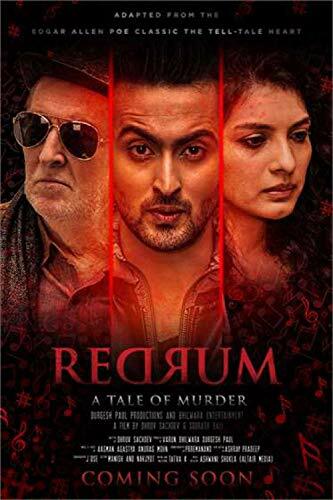 Description: RedruM - A tale of Murder is an adaptation of the Edgar Allan Poe classic The Tell Tale Heart. Touted to be India's first film with a 3D (Binaural) Background Score. The film stars Vibhav Roy, Pakistani actress Saaeda Imtiaaz and veteran Tom Alter in pivotal roles and is directed by the duo Dhruv-Sourabh. Synopsis RedruM - A tale of Murder is a story of a disturbed man who becomes a Rockstar, but even after receiving all the applaud, his complexities and insecurities get the better of him. Daksh, a singer, is doing extremely well up until he falls in love with Aarika. Aarika on attending Daksh's concert is completely swept off of her feet. They instantly fall in love. The stereotype attached to stars about drugs is true in this story as well. While Aarika is oblivious to Daksh being a drug addict, his name is the first to be involved with the drug mafia. Simultaneously we have the police searching for the drug mafia and all their clients. The news of Daksh's involvement with drugs and the police lead him to being kicked out of the band. As the lovers' fondness for each other grows so does Daksh's obsession and consequent anger with Aarika. In this ruckus Aarika blindly believes him and decides to help him with his singing career. She arranges for his performances, however Daksh manages to disappoint her here as well. After being tortured by Daksh, the frightened Aarika finally comes to her senses and decides to help the police find Daksh. The one thing that they are all unaware of is whether they will be able to the see the end of the tunnel. What makes Aarika an accomplice to the police? What happens when Daksh finds out? Does their love pass/fail the test of time? It doesn't matter where you come from, it's what you become that matters most. IS IT TRUE?RedruM - A tale of Murder is an adaptation of the Edgar Allan Poe classic The Tell Tale Heart. Touted to be India's first film with a 3D (Binaural) Background Score. The film stars Vibhav Roy, Pakistani actress Saaeda Imtiaaz and veteran Tom Alter in pivotal roles and is directed by the duo Dhruv-Sourabh. Synopsis RedruM - A tale of Murder is a story of a disturbed man who becomes a Rockstar, but even after receiving all the applaud, his complexities and insecurities get the better of him. Daksh, a singer, is doing extremely well up until he falls in love with Aarika. Aarika on attending Daksh's concert is completely swept off of her feet. They instantly fall in love. The stereotype attached to stars about drugs is true in this story as well. While Aarika is oblivious to Daksh being a drug addict, his name is the first to be involved with the drug mafia. Simultaneously we have the police searching for the drug mafia and all their clients. The news of Daksh's involvement with drugs and the police lead him to being kicked out of the band. As the lovers' fondness for each other grows so does Daksh's obsession and consequent anger with Aarika. In this ruckus Aarika blindly believes him and decides to help him with his singing career. She arranges for his performances, however Daksh manages to disappoint her here as well. After being tortured by Daksh, the frightened Aarika finally comes to her senses and decides to help the police find Daksh. The one thing that they are all unaware of is whether they will be able to the see the end of the tunnel. What makes Aarika an accomplice to the police? What happens when Daksh finds out? Does their love pass/fail the test of time? It doesn't matter where you come from, it's what you become that matters most. IS IT TRUE?